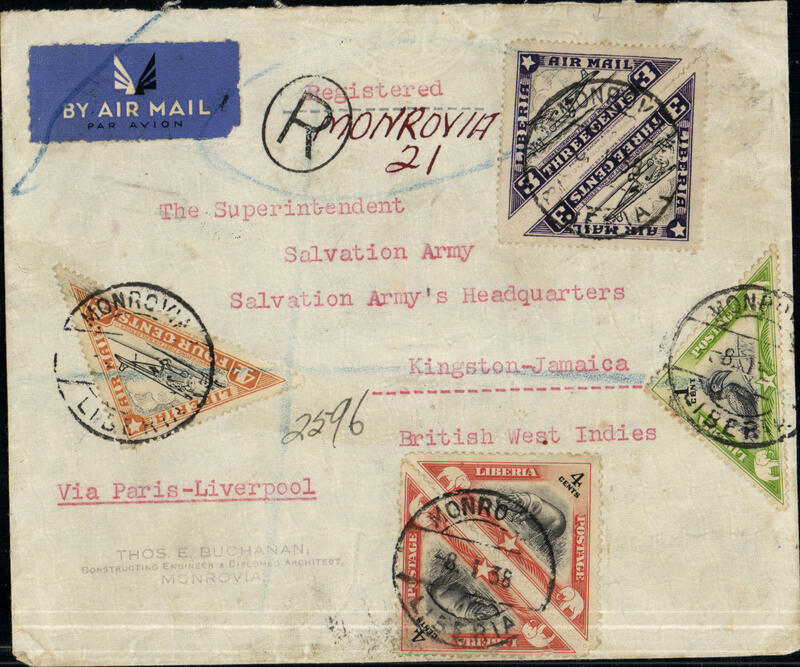 Aeromaritime F/F, Monrovia to Dakar, b/s Mar 7cds, plain cover, 10x22 cm, franked 1936 air 1c x3, 2c x2, 4c and 19c other vals, canc Monrovia/ 6 III 37/Liberia cds, ms "Erste vlucht du/Fransche Airmail/Africa-Europe". 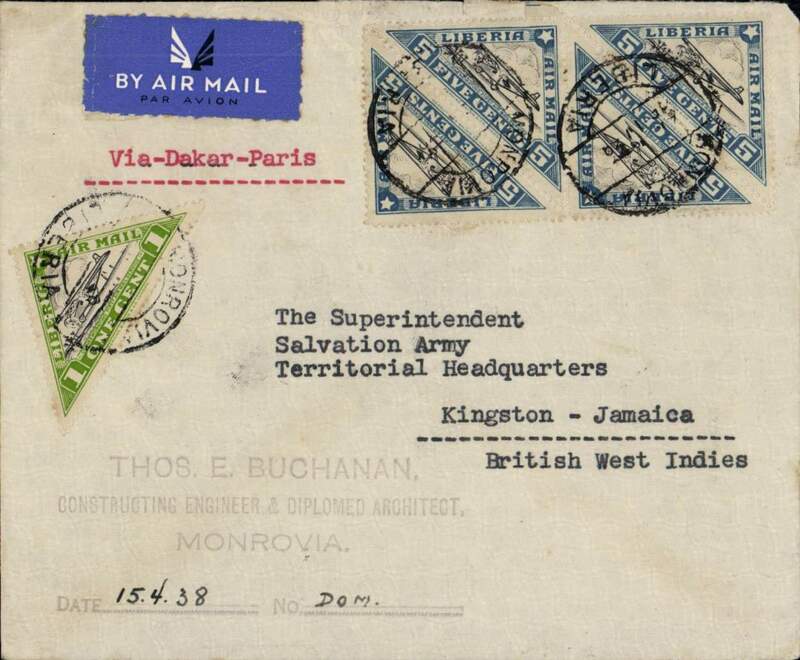 Air France/Aeromaritime, Liberia-Jamaica, registered cover from Monrovia (Liberia) postmarked January 8, 1938 to Kingston (Jamaica) with arrival b/s of January 25. Typed instructions “Via Paris-Liverpool”. Franked on both sides of the cover with Scott nos. 271 (2), 274 ( pair), C3B (single and pair), C3C (pair), C3D (2 singles and 2 pairs), likely Monrovia to Dakar by Aיromaritime, Dakar to France by Air France, then by air to England, and England (Liverpool) by ship to Jamaica. Air France/Aeromaritime, Liberia-Jamaica, registered cover from Monrovia (Liberia) postmarked Monrovia, date illegible, but typed date of April 15, 1938, transit b/s London April 23, ms arrival b/s (in pencil May 10, 1938). Typed instruction “Via Dakar-Paris”. Franked with Scott nos. C3A and C3E (2 pairs), likely Monrovia to Dakar by Aיromaritime, Dakar to France by Air France, then by air to England, and England (Liverpool) by ship to Jamaica. 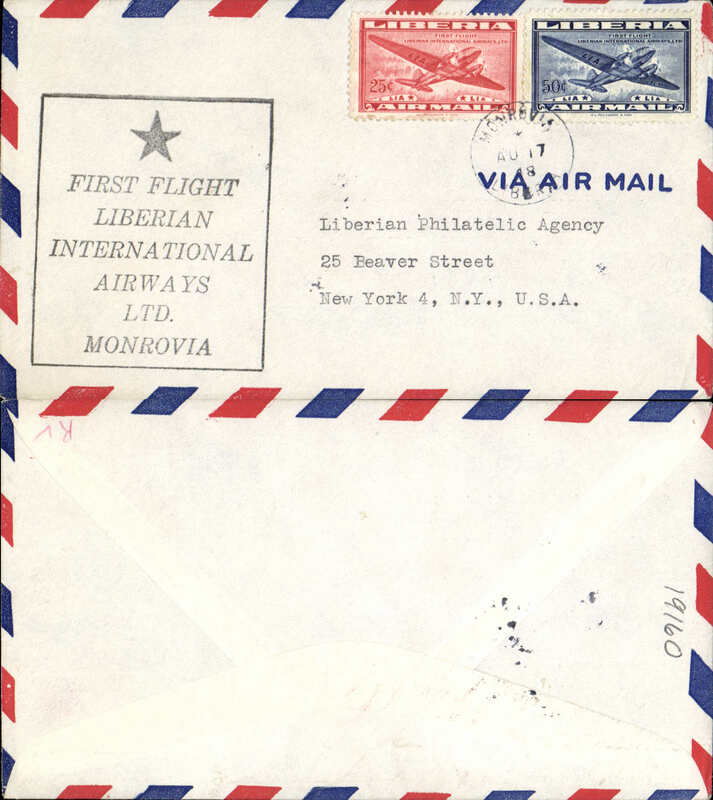 Liberian International Airways, F/F Monrovia to New York, airmail cover franked 25cand 50c airs, no arrival ds, large black boxed flight cachet. 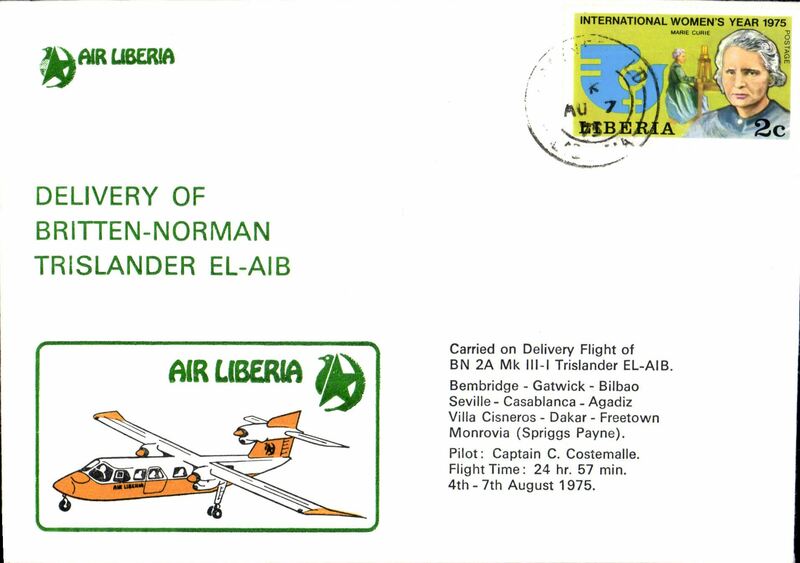 Delivery flight BN 2A Trislander EL-AIB, Bembridge, IOW, GB to Monrovia, arrival ds, Dakar transit hs, souvenir cover, POA, Air Liberia. Image. 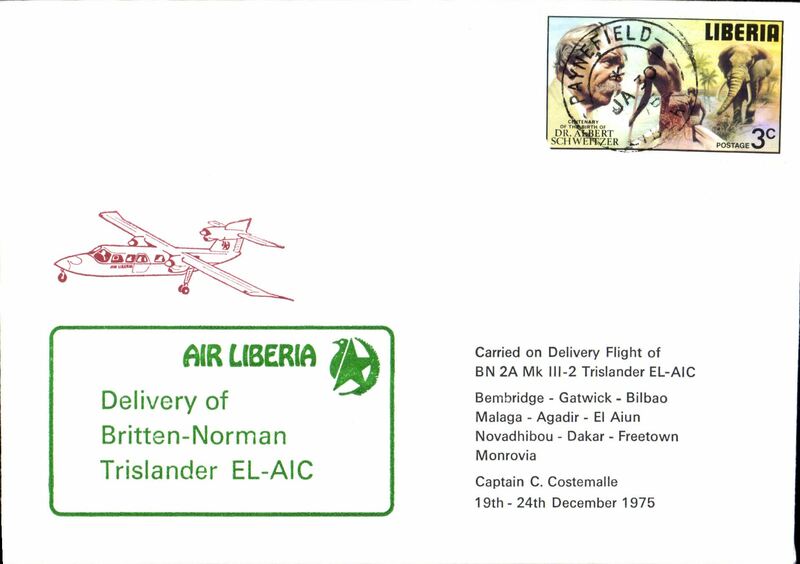 Delivery flight BN 2A Trislander EL-AIC, Bembridge, IOW, GB to Monrovia, arrival ds, Dakar transit hs, souvenir cover, POA, Air Liberia. Image. 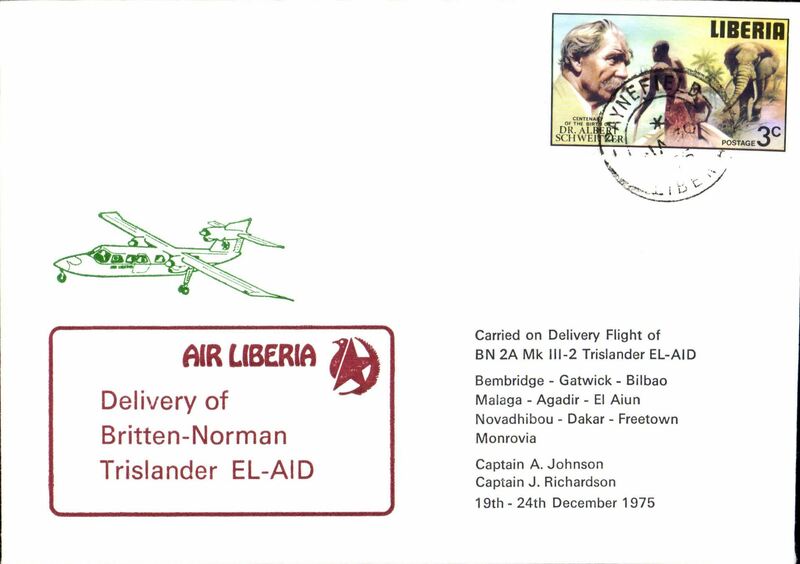 Delivery flight BN 2A Trislander EL-AID, Bembridge, IOW, GB to Monrovia, arrival ds, Dakar transit hs, souvenir cover, POA, Air Liberia. Image.